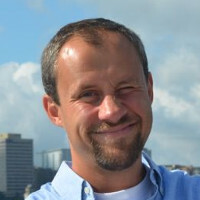 Dr. Pawel Pralat is an Associate Professor at Ryerson University and the Director of Fields-CQAM Lab on Computational Methods in Industrial Mathematics at The Fields Institute for Research in Mathematical Sciences. His main research interests are in modelling and mining complex networks. Since 2006, he has written 150+ papers with 100+ collaborators. He is trained both in (theoretical and applied) computer science as well as mathematics (M.Eng. and M.A.Sc. in CS, Ph.D. in Mathematics and CS), has strong programming and applied research skills, gained through experience in collaboration with the private sector (such as Microsoft Research, Google Research, NXM, Motorola, The Globe and Mail, BlackBerry, Alcatel-Lucent, Environics Analytics) as well as the Government of Canada (Tutte Institute for Mathematics and Computing, part of Communications Security Establishment). Modularity is designed to measure the strength of division of a network into clusters (known also as communities). Networks with high modularity have dense connections between the vertices within clusters but sparse connections between vertices of different clusters. As a result, modularity is often used in optimization methods for detecting community structure in networks, and so it is an important graph parameter from a practical point of view. In fact, many important problems (including clustering) can be described using more general combinatorial objects, hypergraphs. Unfortunately, theoretical foundations as well as practical algorithms using hypergraphs are not well developed yet. Hence, we propose a hypergraph modularity function that generalizes its well established and widely used graph counterpart measure of how clustered a network is.